Stock Android is a great experience, and it's probably one of the biggest reasons that people purchase a Nexus device over other Android phones. Without carrier or manufacturer modifications to the core software, the entire user interface feels a lot more clean and snappy, and this also means that developers encounter fewer compatibility issues when creating flashable ZIPs and custom ROMs. But to gain access to many of these wonderful mods, a custom recovery is often required. That's no biggie, though—Nexus devices are always among the easiest to tinker with. Add in the fact that a custom recovery allows for comprehensive system backups, and there's almost no reason not to have one installed on your phone. 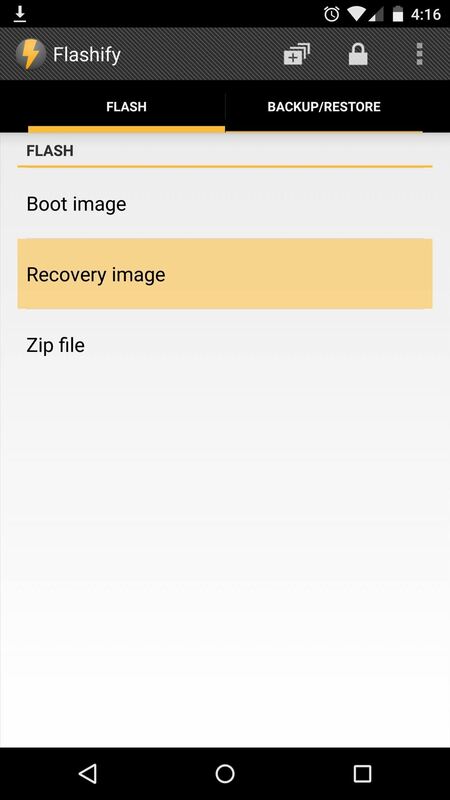 Note that there are quite a few ways to get a custom recovery installed, such as with TWRP Manager or using the Windows program Nexus Root Toolkit. While those methods are certainly hassle-free, the one highlighted in this guide allows for more recovery options and doesn't require any work on a computer. TWRP is our custom recovery of choice here at Gadget Hacks, since its touch-based interface makes it incredibly easy to use, and its OpenRecovery compatibility helps with many different mods. 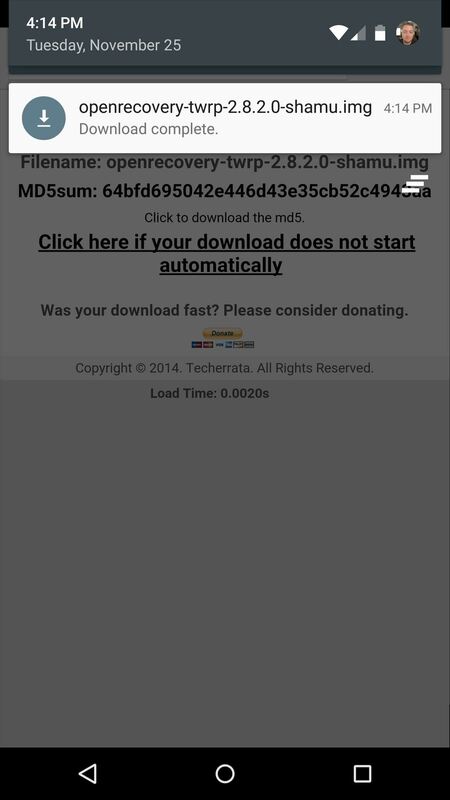 From your Nexus 6, tap this link to grab a copy of the latest TWRP recovery image. 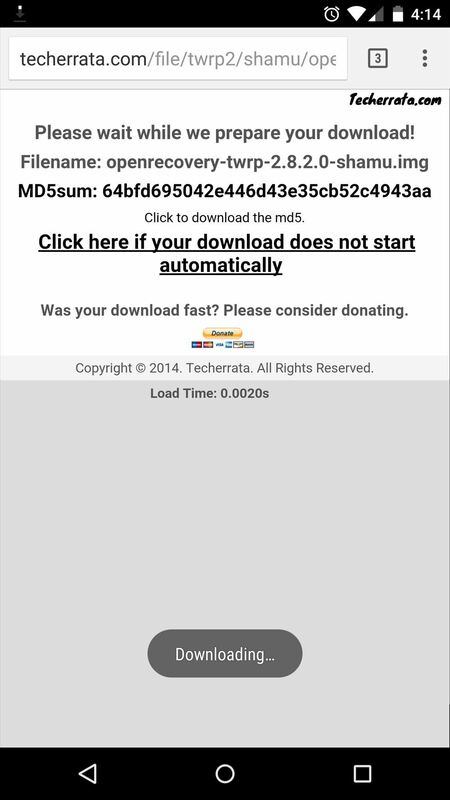 Wait until the download has finished before proceeding to the next step. BusyBox is a set of advanced root commands that allow apps to perform certain tasks. The app that you'll be installing TWRP with today utilizes these commands, so you'll need to have BusyBox installed on your system. 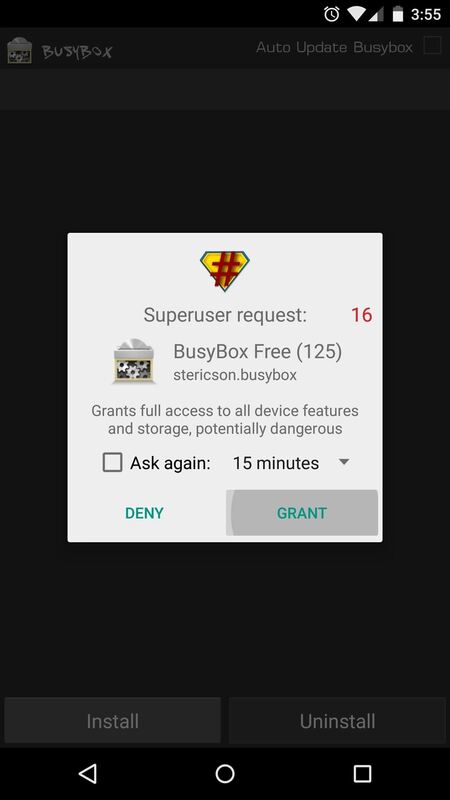 Search for BusyBox by Stericson on your Play Store app, or use this link to jump straight to the install page. Once you have the BusyBox app installed, you'll need to use it to install the actual commands on your device. 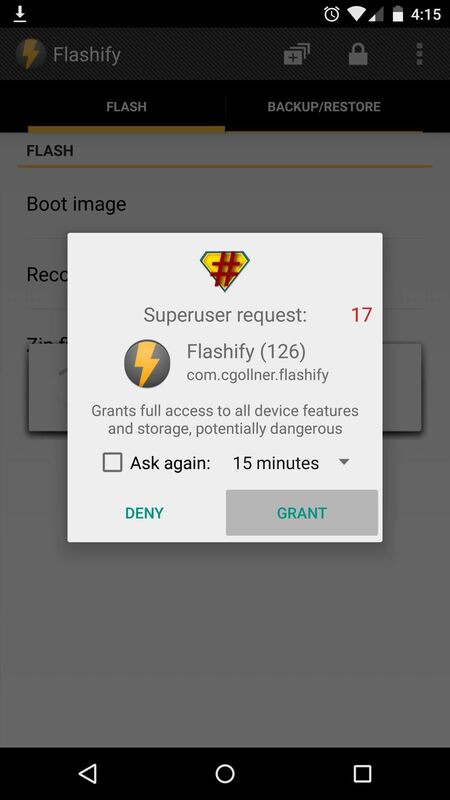 Open the app, then tap "Grant" on the Superuser Request popup, and wait until the Smart Install script finishes loading. When Smart Install script has loaded, simply tap "Install" and you'll be good to go. 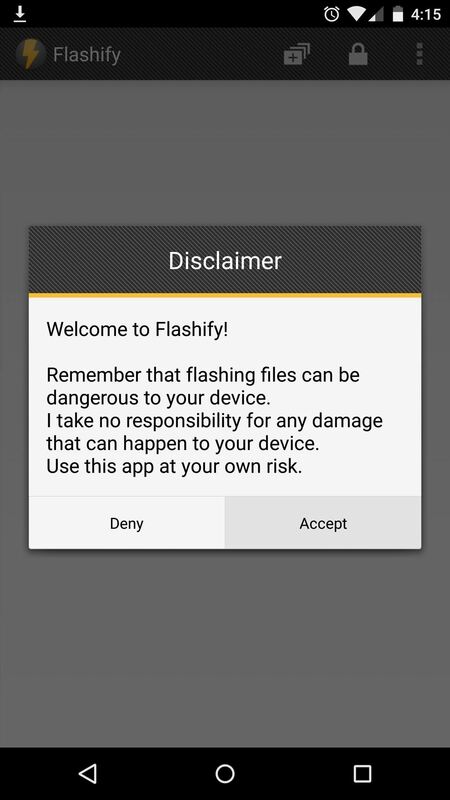 Flashify, from developer Christian Göllner, is a great tool for installing image files (such as TWRP) on your system. You can download the app for free on the Google Play Store at this link. Once you've got Flashify installed, go ahead and open it. Press "Accept" on the Disclaimer popup, then tap "Grant" on the Superuser Access dialog. 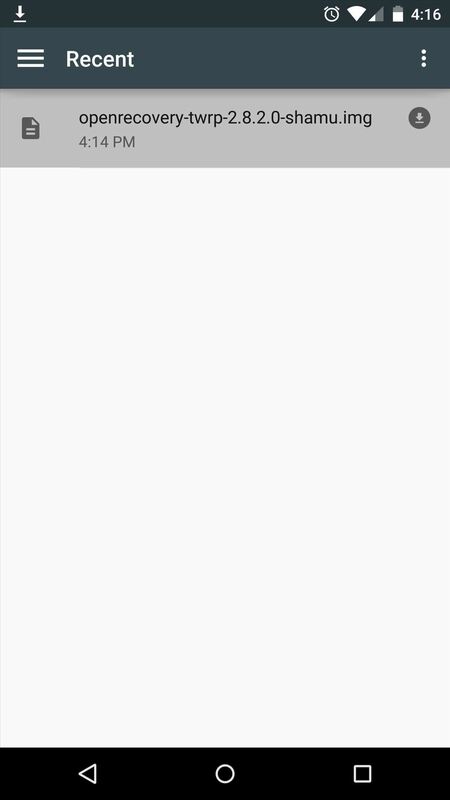 From Flashify's main screen, tap the "Recovery" entry, then select "Choose a file." 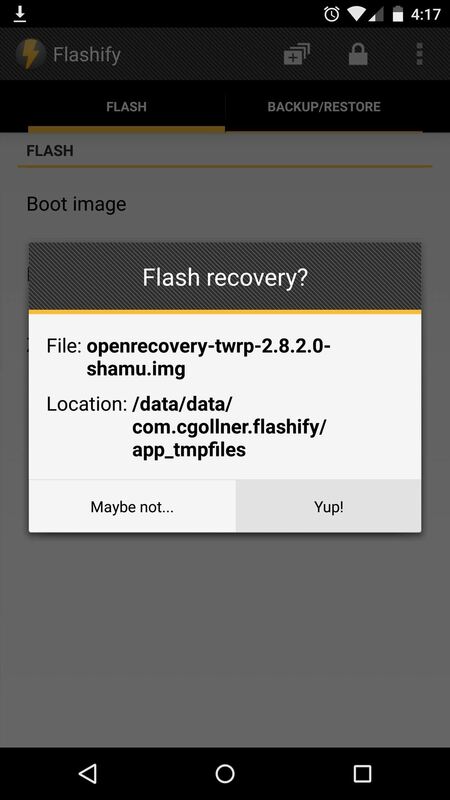 On the next screen, select the openrecovery-twrp-shamu.img file, then press "Yup!" on the popup. After a few seconds, TWRP Recovery will be installed on your device. Tap "Reboot now" to boot into your brand new custom recovery. 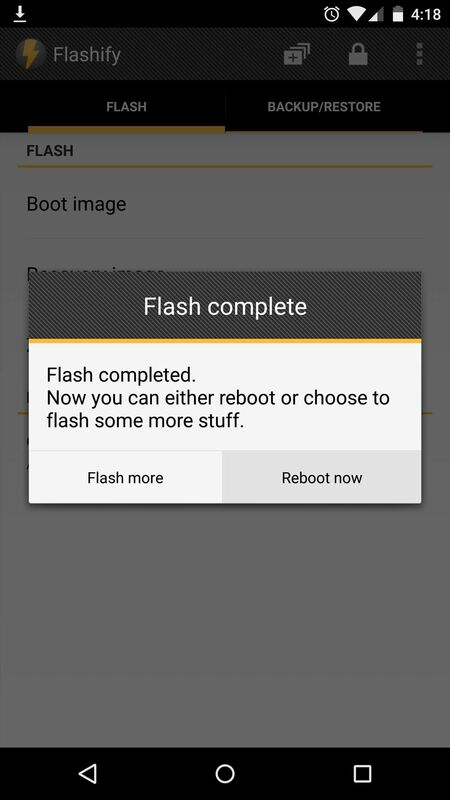 Before you get all flash-crazy with the various mods that you've now unlocked, be sure to make a nandroid backup of your current setup. For more information on using TWRP's various functions, see my complete guide on the topic. What were the first mods you flashed with TWRP? Let us know in the comment section below, as well as on our Facebook and Twitter feeds. What do you think is the best app to use to make backup with? If you're rooted, Titanium Backup is by far the best for backing up apps, in my opinion. But with custom recovery, you can actually back up your entire system in one shot. 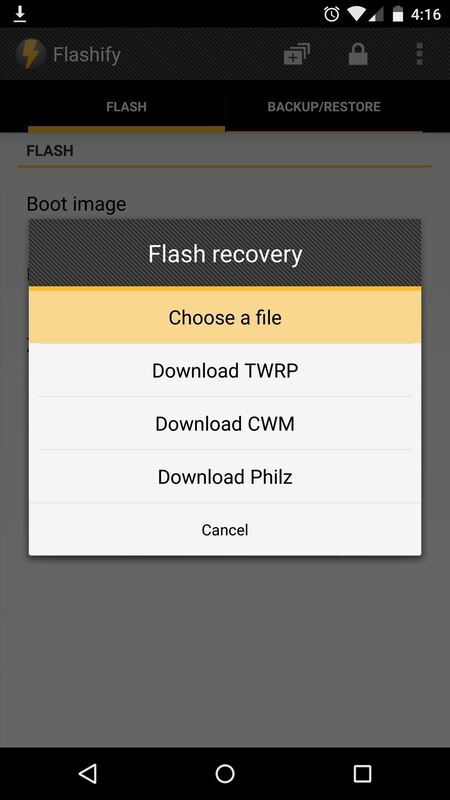 Check out this guide for more information on creating a full backup in TWRP recovery. I followed all these steps but my nexus 5 is stuck in a black screen after Recovery mode is chosen . I've tried vol up + power but nothing happens. Is there a way to revert this ? I did accidentally do this tutorial with my galaxy S6, and, now I'm stuck at the ODIN MODE. Can anyone help me fix this problem?